I wish you health, happiness and peace in the coming year. 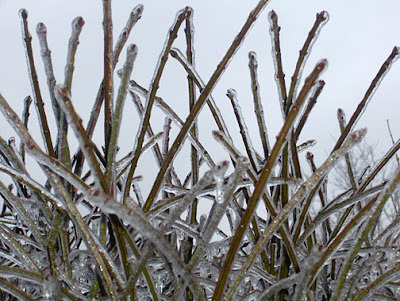 Outside it is nothing but rain, sleet and snow. All day. As dinner approaches, it's not too unusual to see the pizza guy out sliding around making deliveries, because, hey, "I don't want to drive in that." Makes you feel bad enough to almost run after him and tip him a buck — even though you didn't order any pizza. I didn't call the pizza guy. Not because I felt like cooking on a lazy Saturday, but because our favorite pizza places don't deliver. One is an Italian kitchen that makes more authentic Neopolitan-style pizza. One is a place that makes combinations like fig spread, gorgonzola and prosciutto on an ultra thin crust. And the other is a more thick crust traditional place. I almost always order the same pizza from there: five cheese with a wheat and honey crust. I decided to combine some favorites and go for five cheeses and a thinner wheat and honey crust. It came out pretty well for a novice pizza maker. When I started eating local and preaching that gospel, I realize, I stepped into a movement. I took up the banner and joined wholeheartedly. So, it's not a big shock that my heart is a bit heavy in the wake of the farm bill, and the bipartisan resistance to reform. If I force myself to see the bright side, there were a few token wins for small farms, consumers and the environment. The fact that reform was even brought up and made it this far, that's a sure sign that change is coming. Yet, in what has to be the ultimate irony (and hypocrisy) for the issue, Speaker of the House Pelosi, who pushed new democratic reps to not rock the subsidy boat, led the charge to get all organic food in the House cafeteria. I suppose I can hope that they source all that lovely food from primarily Big Organic producers since the USDA is now allowing foods sold under the organic label to include 38 non-organic agricultural products as part of the ingredients. Additionally, "organic" meats can still be labeled as such even if the livestock were given such inorganic substances as Atropine, Butorphanol, Tolazine, and Xylazine. 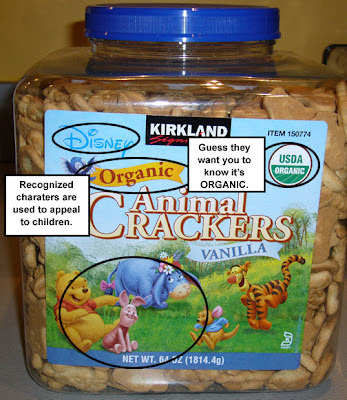 If Big Ag keeps up the pressure to lower organic standards and profit from the consumers' trust in the organic label, and well, the USDA allows it, then we can all be happy that Congress is being lied to at the table along with the rest of us. We're paying for their food, too. Why should they be excused from the same uncertainty we face? Thanks, USDA! Additionally, Monsanto gets to keep contaminating the neighboring organic crops with GM pollen. Monsanto sells 90 percent of the genetically modified seeds in the world, accounting for nearly all the US soybean crop and over 70 percent of the corn grown here. Monsanto execs should have a good holiday, their stock is up nearly 1000 percent and expected to continue to rise. I know, the holidays are here. I should drop the warrior mode (more of Don Quixote futility at the moment) and just post some cookie recipes, or perhaps some of Paula Deen's holiday ham recipes for Smithfield Farms. I'll find some good cheer, I will. Deep down in my crushed heart, I hope that Santa, or some force of supreme justice, really is watching. But, frankly, we can't count on it. All we can count on is us. And what each of us can do about this. Vote the Big Ag-supporting reps out and tell them why you did it. Tell them what you think of their choices while they are still in office. Eat local as much as possible to keep our family farms alive. Get aware of the issues and participate, even when it frustrates you and angers you. Because, oh hell yes, they better watch out. We're awake now, and we know when they've been bad or good. I can't believe how many folks are feeling stressed this holiday. Seems like more than normal. With tasks like being in charge of the family dinner AND having a little one running around, or just feeding the masses, and juggling work and getting the house clean, who can blame them? It's that time of year. For a month or so, women who are working at home or out of home, taking care of kids, keeping up the house and already overwhelmed suddenly feel obligated to become a decorator, cook, hostess supreme, personal shopper, card writer, and pastry chef all at once. And on top of already busy lives. I'm not saying men don't help, many of them do. It just seems like women feel the most pressure to measure up to some perfect holiday measuring stick. Kind of takes all the fun out of the holidays, doesn't it? I'm thinking maybe we should all do less of the trimmings and more of the tidings. That's right. Stop and enjoy the people you love. If the mistletoe is a bit askew, well, angle your head when you move in for the kiss. And have another rum ball — that some one else made. This you can make ahead up to the baking step, then cover and chill until it is ready to go in the oven. Add some extra baking time. Beef Braised in Red Wine — braising is great when your guests might run late. The meat stays moist and is an effortless main dish. Double the recipe, using two 3lb roasts. Sauteed Chard with Clementine Oranges and Feta — adds a bit of color, quick and easy stove top. You can chop the chard and section the oranges and make the dressing the night before. Or, assign a guest to bring a salad. Green Beans Sauteéd with Roasted Tomatoes and Shallot — I am thinking if you just have one oven, it will be full, so this is also a stove top dish that is quick. Again, you can prep and chop all the veggies the night before. Couple loaves of bread (bought from the bakery) and dessert. Dessert could be as easy as having guests bring a few of their cookies from the season and served up as a whole smorgasbord of cookiedom. Another quick and easy idea is to make a pound cake (again, day or two before) and serve it with a topping like honey-chocolate ganache or even a store-bought ganache if needed. Pound cakes are usually moist, don't require layers or frosting. This makes a one-step dessert. We have a couple of those crazy bundt cake pans around here, even one that is shaped like a ring of Christmas trees. Dust on some powdered sugar and you look like a Domestic Goddess without the work. Put chocolate in a bowl. Heat the honey, cream and butter in a small sauce pan. Bring to a boil. Pour over the chocolate. Whisk until smooth. You will have to warm this up before serving if you make it ahead. Store it in the fridge. This variation on a ganache was inspired by this really tough-to-make frozen chocolate mousse dessert thing with truffle cake base. I made it once, and I think you would have to pay me to make it again, even though it was really good. The original recipe (it's the cover photo) can be found in Marcel Desauliners' Celebrate with Chocolate: Totally Over-the-Top Recipes . Diet and nutrition experts are the first to recommend reading the labels on food items. But they don't tell you what to read, and what not to. 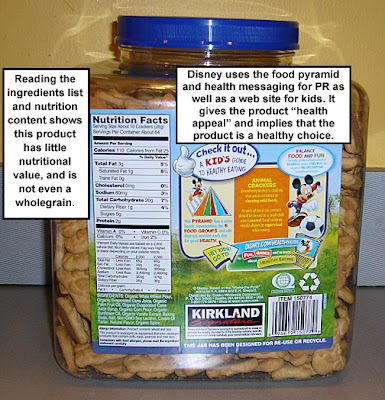 Here's a great example of how the marketing content on a food label can distort the truth about a product. See? Just another friggin' cookie with refined white flour and natural fats and sweeteners in place of hydrogenated oils and HFCS. Here are some easy instructions to help you avoid being deceived. Step 1: Read only the ingredient list and nutrition information. Step 2: Pay close attention to the serving size. taste of berries, not actual berries. See how that works? Deceptive, and yet legal. And totally undetectable in your five seconds to view the label on a hurried shopping trip. The food industry, like so many other entities (Bush administration for example) are counting on you just scanning the great big print and making an incorrect, if implied assumption. You can read the list of the worst of these nutritional innuendos at the CSPI site. You know those days when the writing on the wall is screaming at you and you ignore it anyway. Yeah, those. I had this cookie dough. This impossible, crumbly, difficult cookie dough. And I had this child, this tired, cranky, difficult child. And I said, "Let's make cookies!" I said it despite the screaming. No, not the wall screaming at me. The child. The two time outs before dinner, the not listening. The one-out-of-three-star day at pre-school. It all added up to about an hour of pain. Of out of control Terrible Twos and angry mommy. Oh, the pain, the pain. And then, it was over. As the cookies crumbled, we were washing our hands. I said, "Kiddo, Mommy was cranky, and snapped at you. And you were not so good at listening, too." "Yeah, not fun," she said. "I think we can do better. I'm very sorry. Are you sorry, too?" "Me, too, Kiddo. I love you." Pick your recipe carefully. Make sure it has a good task in it that your child can do. Leave the difficult recipes for another time, or leave them out. Decorating and sprinkles are ideal projects for kids, if a bit messy. The finished cookies also remove the chance of your child eating raw eggs in the dough. Pick your time even more carefully. If the kids are not alright, most doughs can chill for a couple days. And so can you. Make sure you are up for it, too. Tell your inner-Martha to get lost. Holidays are a lot more fun without that kind of pressure. Consider a few child-friendly tools. I realized my finger-crushing marble rolling pin was better left in my hands. I bought a child-size silicone version for the small sous chef. I hate my bad moments as a mom. They make me feel like putting myself in time out. This weekend, I'll have another chance. A whole batch of sugar cookies to decorate and a couple kids to help. Wish me luck. I know food politics are low on the totem pole of issues compared with getting out of Iraq, global warming and health care, and overall just finding someone we can trust to be in Washington. But we should care, we eat every day and what we eat is tied to both our health and the environment. Hell, I wish eating local would help bring the troops home, too. But, it can't. And I am voting, partially with my fork, for change. Which is why news like Hillary's ties to Big Meat (Smithfield and Tyson) are particularly disturbing as I look to the Democratic landscape of candidates. Even Nancy Pelosi is singing the praises of subsidy and going against Farm Bill reform. Looks like all attempts toward major subsidy reform just died on the table. All-in-all, not a good showing for our Democratic Congress or most of the candidates. It gives me all the more resolve to keep promoting sustainable ag, and local eating since it just hasn't gained ground as a key issue yet with those who would be president. Do you want to know who is getting the subsidy payments in your state? Here's a helpful database that will give you a quick summary. And more background information on the topic is also here at Mulch. Charlotte at The Great Big Vegetable Challenge has worked her way through the vegetable alphabet and is now at Q. I've racked my brain, and am sure she has hers, and I can't think of a vegetable that begins with Q. Charlotte's creative solution is to make Q a "quick" category and all the recipes should be vegetable dishes that can be prepared in about ten minutes. Steam carrots for about 8-10 minutes. In a small saucepan, melt butter and mix with the honey and balsamic vinegar, mix and heat on low. When the carrots are steamed, place them in a serving bowl and pour the glaze over the top. Toss to coat. You can learn more about The Great Big Vegetable Challenge and the upcoming book in this interview at Kid's Cuisine. You can also vote for GBVC as a Food Blog winner in the Family category! It's the randomness of trying to please our little diners that gets frustrating. The same child who happily gnaws on a curry chicken kabob and begs for candied ginger, next turns that button nose up at a bit of cayenne with a simple, "Too Spicy." Too spicy means heat, but not-too-spicy can have flavor and quite a bit of spice. There are always surprises. Such as seeing your little one gnaw away on a braised lamb shank happily, and getting asked a second time for more broccoli when you forgot the request. There are bad surprises as well. A whole plate of favorite foods that does not even get a nibble. It's all pretty random, but sometimes there is a pattern, it just takes months sometimes to see it. So it was, in arriving at how to spice a Moroccan-inspired lamb stew. I do not say "Moroccan." Because it is not, and I would have a long way to go (in fact all the way to Morocco) to understand the food before I could cook it. But, the recipe has some nice depth to it, without heat. We prepared it together, the three of us, little on standing on a chair between us as mom and dad did the chopping and slicing. Mark Morford on Black Friday. "Is this why we're suffering such a general feeling of ennui and disgust and apathy in the culture right now, the nagging feeling that we have no center and God has abandoned us and we therefore simply cannot consume enough goods and technology to try and fill the void?" I'm trying to keep the holidays focused on the right things this year. Articles like this keep me steady in this conviction. Kind of like "Jelly of the Month" but more fun. Sorry, Clark. This one was a good one to give the Kiddo to test the limits of "neophobia." Not a shock, she liked it right away. Which makes me wonder how orange food ever got rejected, seems pretty tame by comparison to this. What is it? 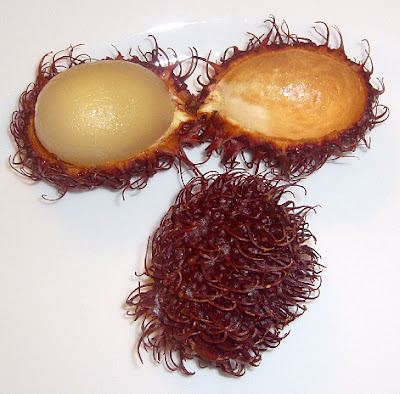 Rambutan, a relative to the lychee and native to Southeast Asia. Tastes like a mild lychee, not bad. Think about all of the ways we wish for things. Wish upon a star, a coin in a fountain, a birthday candle extinguished; all with a silent wish attached. Always with the warning: Don't say it or it won't come true. When you think about it, this is pretty stupid. I mean, if you are just silent, how is anything ever going to happen, especially if there are others who can help? I recently got an invite to American Public Media's web project "The Consumer's Dilemma." In the project, you can view other people's thoughts on making the world better and more sustainable, and you can submit your own desire or idea. The ideas are reviewed, and can be browsed and searched. So, if you ever wished silently that the world was a better place, well, now you don't have to be so silent and it might even come true. What did I wish for? A bit complicated, but here goes. A friend who is a local farmer and I were talking about the "dream CSA." His thought was to have the farm not just supply food to the families that support it, but also walking trails and fishing and hands-on experience. To this, I added "Oh, and a kitchen where people can learn how to cook their produce and food with a teaching garden!" And produce from the farm to go to supporting local food banks. You can't just hand off a bag a produce and be done, though. Anyone in a CSA knows the kind of time it takes to prepare a meal from scratch. It also takes pantry staples. Not an easy task for anyone busy just trying to make ends meet. I want to marry the idea of one of those Super-Supper-build-your-meal places with the donated local produce and meats (or an urban garden center attached) and the pooling of food stamp money to buy the staples in bulk at a discount. Thus, very busy "working poor" parents (often single, working moms) could have all the advantages of fresh produce, bulk food purchase discounts, AND ready-to-go healthy meals. Sort of an end-to-end solution. If you think about it, this is the exact demographic that meal-prep places would serve best (if they were non-profit), plus the concept has empowerment, education, cultural and a social group benefits to it. That was my idea/wish. Now, go share yours. Pennsylvania's Department of Agriculture Secretary Dennis Wolff led the charge to ban voluntary labeling on milk that is hormone-free. It seemed like an odd move when even the FDA resisted Monsanto's (maker of rBST) pressure to ban the labeling. Turns out, Wolff is a dairy farmer himself. I am betting he is not one of the producers who is rBST-free. Thankfully, state governor Ed Rendell has decided to review the decision. I am thinking he should also be reviewing a decision on whether to fire Wolff. These kind of inside advantages are a direct cause of many of the problems we face with our food system. To get a perspective on the closed loop between fertilizer, commodity growers, feed and the meat industry, read this insightful article over at Ethicurean. It makes me want to hug our freezer full of local meat. The Battle of Orange Food seems to be a foregone conclusion, victory — most of the time — to the chef. I’m not crediting my cooking skills as much as I would say persistence. Near-obsessive persistence. With the Kiddo requesting multiple helpings of carrot soufflé and sweet potato fries, I could probably back off. I could, but there is the small problem of nearly 100 lbs. of pumpkin, squash and sweet potatoes still lurking. Like something out of Edgar Allen Poe, I find myself haunted by visions of the Red Warty Thing, all 30 lbs. of its lumpy, russet mass daring me to pick up a chef’s knife and do something about it. It may take something more like a hacksaw to breach that rind, though. So, I opted for a couple of its small cousins instead. It’s nice to have local produce still around and a freezer of meat for the months ahead. I will miss the fresh greens and abundance of summer, but we’re still as local as we can get for the off-season. Kiddo even woke up heartbroken last weekend missing the market. I’ll be trying to keep her distracted with Christmas events and baking. In case you think I have lost my mind, (or more of it), that IS a monkey plate garnished with chopped parsley and orange slices. I’ve been trying to up the presentation factor for the Kiddo’s plate to see if it makes a difference. The leering primate kind of detracts a bit from the overall effect, but I do what I can. 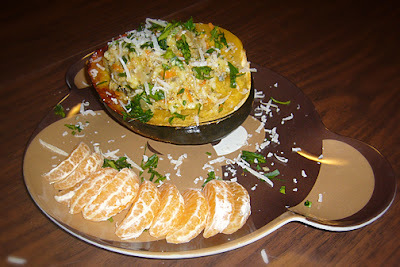 Which is, in this case, Pork and Carrot Risotto with Parmesan served in a half Acorn Squash. Kiddo gets regular helpings of Chicken and Rice “casserole” at school. I thought it was time she had the real thing. She liked it. In my first couple holiday seasons post-childbirth, I've did a pretty lousy job of decking the halls. Let's see, the first year, the tree went up the day before Christmas just as the toys got assembled and stockings filled. We would never have made that deadline without the help of a bottle of good wine and the help of a couple of our Jewish friends. They enjoyed the whole experience quite a bit! 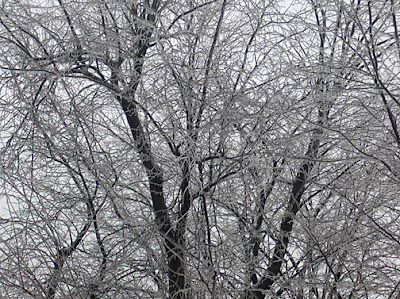 Last year, I made the deadline for the tree just a few days earlier, but not much. Friends who live in the neighborhood sneaked over and put lights on our front bushes for us because we had none. The same friends also assisted with the assembly of the pink retro kitchen set. Thank goodness for friends! This year, by some miracle (I think they call it sleep) and the help of a little Elf, the tree went up the day after Thanksgiving BY NOON. 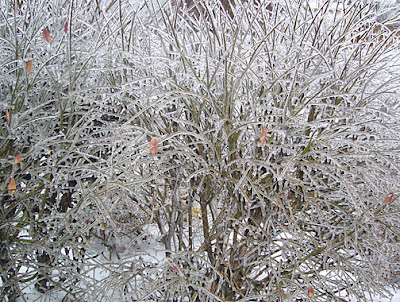 We even had lights on our bushes that same day. Sure, most of the unbreakable ornaments are stuck in clumps near the tree bottom. The outdoor light display didn't fare much better. And, yes, Santa's Little Helper finked on Mommy for breaking one of the lights, too. Perhaps Martha would frown on the tacky assortment of leftover bulbs in various styles. Or upon our tree which is not color-coordinated with our interior decorating (or lack thereof). I didn't grow my own greenery to create the wreath by hand. And I sure didn't sew my own stockings (my mother-in-law did). You know what? Martha's not invited. And the little Elf is having a ball decking our halls. I'm good with that. Real good. And I'll be good with big, loopy paper chains, glitter-covered styrofoam balls with pipe cleaners, and popcorn garland on the tree when we get there, too. Let the Elf have at it. For everything the Elf and I lack in interior decorating skills, we sure make up for in cookies. That kid can make the best lop-sided cut-outs ever and she can load them up with the sprinkles like nobody else. My favorite Christmas cookie recipe is the deeply spicy gingerbread from the December 2000 issue of Cooking Light. The cookies stay soft and have cardamom and candied ginger in a rich molasses dough. For a festive touch (and to indulge the Elf's strange fixation with sprinkles), I add a glaze made with 1 cup powdered sugar, 1 tsp. orange extract, and about 1 tablespoon of water plus a tiny bit to desired consistency. Let the cookies cool, dip in the glaze and add sprinkles. Lots and lots of sprinkles. It seems odd to look for cookie recipes in any "light" recipe guide, but I have never been able to top this gingerbread recipe for flavor. Some of their other "light" recipes for cookies do need to be "un-lightened" much like my front bushes in late January. Such is the case with their recipe for a double chocolate chip cookie. I took some liberties, primarily with the chips and a few other places. Mix the dry ingredients, salt, baking powder and flour, together in a separate bowl. In the mixer bowl, put the butter, sugars, eggs and vanilla. Mix until well-combined. Slowly add the dry ingredients and mix well, scraping as needed to incorporate. Add the chips and cranberries and mix on lowest setting until folded in. Drop in balls of about 1-1/2 to 2 tbs. each onto a couple greased cookie sheets. Bake for about ten minutes, switching the trays halfway through if you don't have a convection oven setting to make them brown even, and just barely on the tops. It makes just over two dozen. The most important thing for all variations of chocolate chip cookies is not to overbake them. The texture when cooled should be just crisp on the outside and chewy on the inside. It's Monday and the Elf is already asking about making more cookies. This weekend, I promised, this weekend. 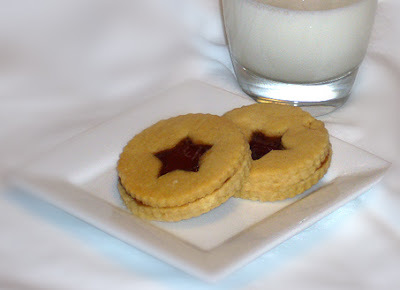 I'm back to the books trying to nail a recipe for Linzertorte and something else new. When I get brave, I will turn her loose with red and green frosting. Hey, the kitchen walls already need painting. What the heck, let's deck those, too.